An original painting, but based on a work by one of my favorite painters, Winslow Homer. Rather than fishing in the Adirondacks in a rowboat, this hopeful fisherman fishes near the Oregon coast in a motor-powered Jon Boat. The original painting was only in my possession for a few days before it was sold, but for the time being you can still get an inexpensive poster print or a framed panel print. I know I am going to! It's depressing when I don't get enough time to enjoy my own work. 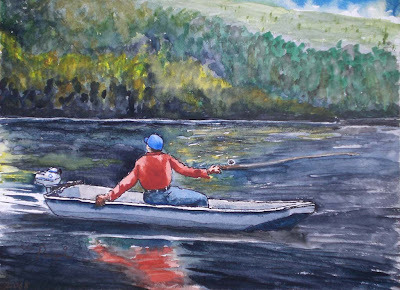 I'm reading: Oregon Fisherman (Watercolor)Tweet this!